Before I go to bed, I decided I’m going to rant about these AWESOME foraging blocks that are all the craze right now in the Avian Avenue community! They are by Kris Porter at Parrot Enrichment. The best part is they are SUPER affordable, and just absolutely WONDERFUL! I can’t lie, my birds aren’t great foragers. But even Kyoko is willing to pry a little nutriberry out of her block! I stupidly didn’t take pictures of just the blocks. I bought the extra small ones which are a perfect size, and when I get out of this money pit i’m in, I am planning on purchasing a few bigger sized ones for Dougie. I got two with the stainless steel hardware, and to save money, you can just reuse them and put them into the other blocks. The blocks are made of untreated fir and smell SO good! It was heaven when I opened the box! They are beautifully crafted with lots of grooves that the birds just love to gnaw on (and mine are both not huge wood chewers!) and little holes to hide treats in. This is a picture of what Coco did with hers from her blog. Her cape, Lola is chewing them up like crazy! Fortunately (and I suppose unfortunately, since I have a lot of wood!) my guys just gnaw on them a little bit, so mine will probably last a while. Speaking of which. Does anyone have any suggestions on how to encourage my birds to chew on wood? Back to the topic. 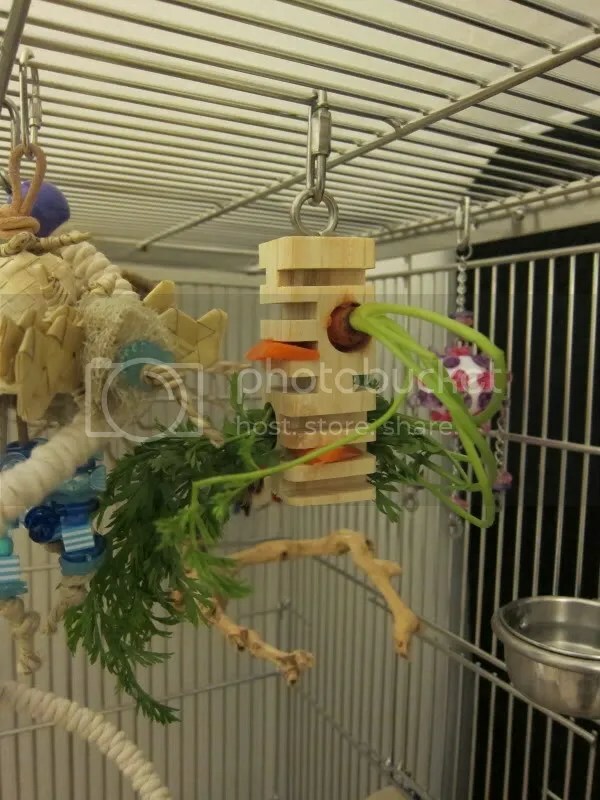 I usually hide treats and nuts in them, since my birds aren’t the craziest for healthy foods, but I did make up a little veggie block for Dougie. Blurry picture but Dougie is in focus! And here he is nomming a hot pepper with his happy crazy caique eyes! My birds have been VERY restless lately! They aren’t used to me going to school for most of the day and being cooped up in their cages! Over the Christmas break they were out ALL day, so it’s a big adjustment! Needless to say, my birds, Douglas in particular, has a LOT of pent up energy! I saw this on Hungry’s Birds blog. And it is a girl who also has a caique and does fun foraging projects. Check her out here. (Not sure if she still updates her blog?). Her caique seems to LOVE foraging, while Douglas… not so much. But neither do I give him a lot of opportunity besides wrapping up little white cups with treats inside. So I had a spare basket after redoing their cages, so I decided to make one up for him. Kyoko, NEVER forages (not even the little white cups), so I made her a small one. I’m not going to put them in yet, but save them for tomorrow. I’ll put them in a bit before school so I can get some pics, then leave them with them all day and see what the results are! Douglas has a wicker basket. Inside (clockwise around) a large wiffle ball stuffed with treats and crinkle paper. Loofah stuffed with treats. Bagel. White condiment cup with treats inside. Finger traps with treats and crinkle paper. Yucca block, partly hollowed out for a treat. And a long tube bagel with treats. As you can tell, my birds are very food oriented. They got a lot of their greens and fruits. But their “special treats” (like nutriberries, ovenfresh bites, etc.) are always saved for foraging, or for super rewards. The complete basket. I also threw some treats right inside the crinkle paper, to get him to explore, as well as some wood and other little toys. Kyoko’s basket is a lot simple. I’m not going to close the box because she’ll completely ignore it, and the treats are kind of right there out in the open. Hopefully she’ll figure it out 🙂 And of course… I gave her a bell!